A&Y: It’s been a big year for My Daddy is a Soldier Adventures. What achievements have you been most proud of? 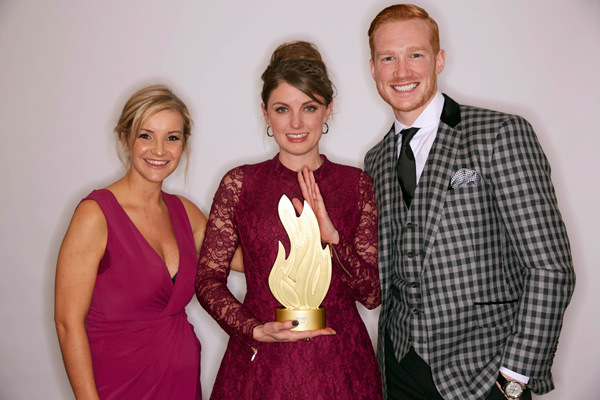 LF: A great moment was winning The Sun Military Award for Support to the Armed Forces, which raised awareness of the charity and the vital support we provide for Little Troopers. Also, heading to 10 Downing Street to talk about the Service Premium with Nicky Morgan MP, travelling to Sennelager in Germany and Lisburn in Northern Ireland to run events for children with soldiers away… there are so many achievements and so many more I’d like to list! Ultimately it has been an achievement to continue to grow the provision and community with just myself running the charity alongside a full-time job. You have launched a £1 million campaign to create a permanent adventure centre. How important is such a facility to Army families? I feel it is really important for military families to have a centre dedicated to recognising, supporting, educating and including. A unique centre providing a retreat for Service families, offering many outdoor and indoor activities to families pre and post a separation period. Our centre will have residential space and camping facilities to be open all weekends and school holidays, offering child-only weeks in the holidays for Little Troopers and in military young carers’ week and so on. The centre will also have the capacity to run workshops for parents to help support schools to learn about Service families and how our provision can ease and aid separation periods. It is so important a facility such as this should exist. Army families face unique challenges and these should be considered and supported. I’m so excited about this campaign and look forward to gaining momentum with the project throughout 2015. How does being an Army spouse compare to being a serving soldier? What tips could you offer to other military spouses? I get asked this question a lot. I actually found being the soldier and going away was much easier than I find being the one left at home. Personally, with every deployment and period of separation we experience as a family I find it gets harder. I rely on the charity for support too – it’s such an amazing community that has grown. My tips? Keep busy, go to anything and everything and make lots of plans with friends and family if you can. Sunday is the worst day. Even if it is just going to the shop, make sure you get out of the house once a day when your soldier is away as it breaks the time up. Have a routine and make sure you come and find My Daddy is a Soldier Adventures! Has it been challenging to grow the charity given the amount of other military-focused groups around and the recent state of the economy? I had no previous charity experience, so it has been a real learning curve creating My Daddy is a Soldier Adventures. I do have many years’ experience of the military and separation and I’m passionate about it and I really think that has helped. Funding is something I have cried tears over. So many don’t see these children as needing support or as being disadvantaged, so we get turned down for funding all the time which can be so disappointing when I read emails from desperate families really suffering. There is no other charity out there specifically supporting children of serving personnel. We aren’t a duplication and it is needed. We aren’t in competition with any other military group, so we are a complementary, more informal approach to providing support and ensuring Army families don’t experience disadvantage or reach crisis point. Do you find Army children to be particularly resilient given everything they have to cope with? Army children often have no other choice than to be resilient so they become accustomed to being just that. But that fact doesn’t mean they don’t feel or we shouldn’t recognise that they experience challenges they find difficult sometimes. I believe that Forces children will grow to be confident, strong and independent due to the childhood that often comes with being a child of a soldier but we need to help and support them to enable this outcome. For example, my daughter is 12 and will be starting a new school every September for five years due to the way our postings have worked out. This September will be her fourth school of that cycle due to us moving again this summer. I’m confident she will be ok due to her resilience, but she still says “Mum, when I think about starting a new school again this year I get butterflies in my tummy”. Little Troopers are resilient and they will cope, but we need to be a helping hand in ensuring they are supported. What plans do you have for the future of the charity? I want the next year to be a fundamental year for the charity – there is so much I still want to achieve. Enquiries from Royal Air Force and Royal Navy families have increased dramatically, showing there is a need for the provision the charity provides to expand to include those families and rightly so – they too experience separation. Tri-Service is something I am aiming towards but there is a lot of work that needs to happen to make that possible. Little Troopers Treasures is an initiative I am launching which I am so excited about. It has been in my head for about 18 months and to see it come to life is amazing. It’s a group of communication resources to ensure soldier and child stay connected and bonded even when apart. Keep an eye out for that in the autumn! The Adventure Centre is also something that will be a focus – the ultimate goal for the charity in the future! Why should we accept poor standards?